We, the undersigned human rights and civil society organizations, write to urge local and international institutions and NGOs to condemn the ongoing grave violation of people’s human rights and illegal interference in Yemen. We would like to echo the UN Secretary General call for a freeze in all forms of violence and urge the UN Security Council and the General Assembly to take immediate actions to stop all external attacks as well as any cases of internal conflicts and violations of human rights. According to Yemen Ministry of Health, the first month of heavy bombardments in Yemen resulted in over 4100 Yemeni casualties, including 115 children according to UNICEF, also, according to the World Health Organization over 254,000 others including women and children are being displaced, and there are fears over the forced displacement of millions of other Yemenis while many of them lose their lives in the sea trying to escape their conflicted homeland. 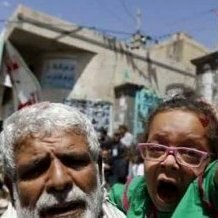 Airstrikes launched in and around Yemen's capital Sanaa, targeted bazaars, schools and hospitals leaving many civilians people killed and injured. This is while, a UNICEF representative in Yemen expects an "upsurge in malnutrition across the country" in the coming weeks. "It was already a country where 60 percent of the people were living under the poverty line, that's not going to get any better," he said. Also, a UN humanitarian coordinator in Yemen, said an "immediate humanitarian pause in this conflict" was desperately needed to step up aid deliveries, adding that "The situation in Aden is extremely, extremely preoccupying if not catastrophic". The civil society actors are deeply concerned about the ongoing violence in Yemen. For example, Amnesty International is disturbed by the high number of civilian casualties and deaths as a result of Saudi Arabian led airstrikes in the Yemen announcing that “the high toll of civilian deaths and injuries in these attacks raises concerns about compliance with the rules of international humanitarian law.” Also, Human Rights Watch, in letters to Saudi Arabia’s King and U.S. Secretary of Defense, expressed concern that some of the airstrikes conducted by a U.S-backed, Saudi-led coalition in Yemen appeared to violate the rules of engagement and urged the United States and Saudi Arabia to take steps to minimize harm to civilians. Considering the fact that Yemeni people are suffering from the bitter consequences of violence, despite the announcement of a cease fire, immediate actions are required to stop the ongoing violation of human rights, and hold the human right violators accountable.